The American Disabilities Act proclaims that all persons with disabilities are entitled to independent living. Just as families have different needs and resources, independent living can be provided in different ways. In previous blogs we have examined state institutions, a private residential institution, and the abundant living situation of a young woman making her home with her mother. Another alternative is the group home, designed to serve children or adults with disabilities. Such homes usually have six or fewer occupants and are staffed 24 hours a day by trained caregivers. Although most group homes provide long-term care, some residents eventually acquire the necessary skills to move to more independent living situations. The development of group homes occurred in response to the deinstitutionalization movement of the 1960s and 1970s. They were designed to provide care in the least restrictive environment and to integrate individuals with disabilities into the community. Since the passage of the Community Mental Health Centers Act in 1963, grants have been available to group homes. Although state and federal funds continue to support the majority of group homes, some homes operate on donations from private citizens or civic and religious organizations. Unfortunately, the number of available group homes has not always matched need. One of the goals of group home living is to increase the independence of residents. Daily living skills include meal preparation, laundry, housecleaning, home maintenance, money management, and appropriate social interactions. Self-care skills include bathing or showering, dressing, toileting, eating, and taking prescribed medications. Staff also assure that residents receive necessary services from community service providers, including medical care, physical therapy, occupational therapy, vocational training, education, and mental health services. As with any type of organization, some group homes are better run than others. Factors that contribute to group home success are a small staff-to-resident ratio, well-trained staff, and a home-like atmosphere. Before considering group home placement, extensive planning should be conducted. The individual’s strengths should be incorporated into the plan whenever possible. For example, if a supportive family is an identified strength, the preferred group home should be close in proximity to facilitate family visits. 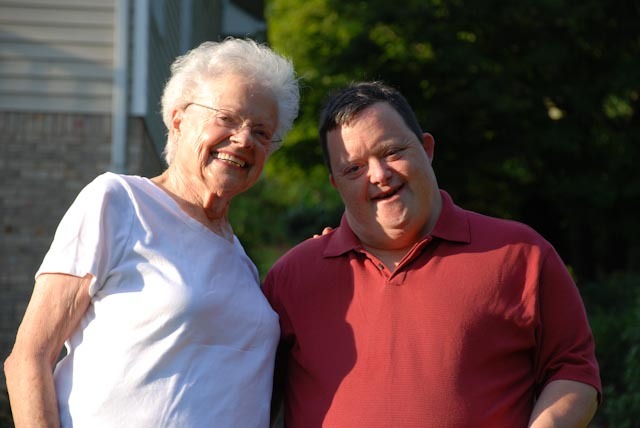 Sometimes, when a group home or other desirable facility is not available, devoted and energetic parents and volunteers elect to build a suitable home for people with disabilities in their families or community. Our next blog will introduce a parent whose efforts are endless in developing an independent living situation for her son and others. Billy Schulz Welcomes You to Food City, Colonial Heights! 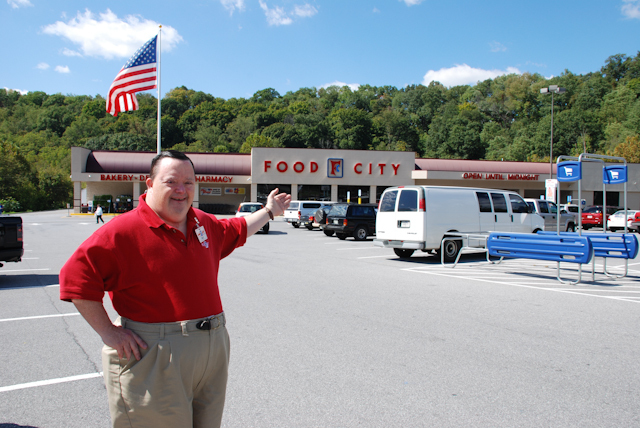 Billy has worked at Food City for more than nine years. There are two stores, one on Eastman Road down town and one in Colonial Heights, where we live. Billy started at the Eastman Road store because that’s where he was placed and trained by Good Will. A few years ago, when they built a new store on Eastman Road, he worked at Colonial Heights during the building process. At that time I thought he might stay at Colonial Heights, but no, he wanted to be at the new store! And of course he wanted to work with his dear friend Jonathan. This summer two things changed. The Colonial Heights store was enlarged and improved and, most meaningful, Jonathan moved away. Billy grieved when Jonathan left and felt a tremendous loss. He began to consider moving to the Colonial Heights store. We talked with the manager at Eastman Road, Ed Moore. If you have seen the interview with Ed on our website you know what a remarkable person he is. He agreed to allow Billy to relocate and we talked with the manager at Colonial Heights, who said he would have a place for Billy. 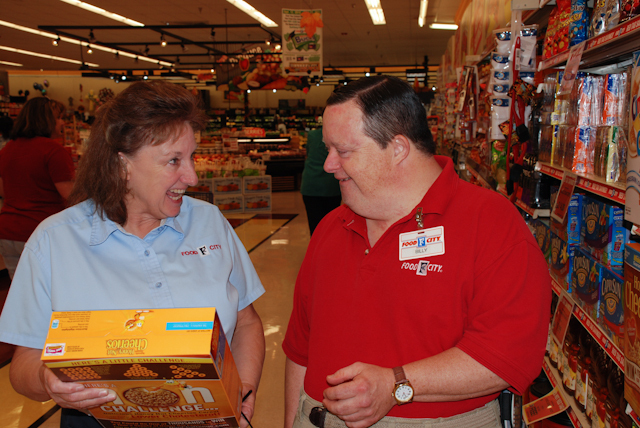 A very positive factor was the presence of Sue, an assistant manager at Colonial Heights, who had worked previously with Billy at Eastman Road, and had wanted Billy to join her. One day Billy said, “Mom, I ready to move to Colonial Heights.” I was delighted at the prospects of having him closer to home, about a five minute drive away, and just hoped he would not be lonely without the friends he had worked with for so long. Once again we have a happy man. With the growing dissatisfaction with large state institutions, there has been a vast depopulation of large state facilities between 1990 and the present time. Several states (Alaska, the District of Columbia, Hawaii, Maine, New Hampshire, New Mexico, Rhode Island, Vermont, and West Virginia) closed all their large state facilities for persons with developmental disabilities. In addition, 27 other states reduced their large state facility populations by more than 50% over this time period. While there are a number of alternate living situations which we will explore, there is still a need for residential placement for some persons, and for many this is a good solution. Let me give you an example. Frances lives at Annandale Village near Atlanta Georgia. Her mother, a widow, lives about an hour away. Frances has an intellectual disability and requires close supervision. Her mother realizes that this will be a lifelong condition for Frances, and she wants to be sure that her daughter will have a good life even after her mother dies. They investigated a number of living situations and found that Annandale would meet their needs. The slogan for Annandale is: “Their community..with our help.” The residents (referred to as “villagers”) form a family-like community engaged in work and play in a safe, sheltered home. Begun in 1969 with 8 residents and a staff of 4, it now has 95 villagers with a staff of 88, with 15 residents in a special care unit and 15 in day care. The community is comprised of 10 residences, with choices of private apartments, semi-individual apartments, cottages and a 24 hour special care facility. Annandale has 3 program tracts, based on individual needs. The programs include vocational opportunities, both on campus and in outside business organizations. The villagers market art work, have regular exercise and activities, and cultural opportunities in the area. Frances visits her mother from time to time, but calls Annandale home. Her mother also visits Frances and has the peace of mind in knowing that she will have that home as long as she lives. You can see pictures of Annandale on their web site: www.Annandale Village.com. There are a number of good residential facilities throughout the states. I don’t know the cost of the care but feel sure that this is a good solution for some families. In future blogs we will discover how other families and agencies provide independent living for persons with developmental disabilities. Let us know what you think and share your discoveries. Jane and Billy Schulz heard good news about Rosa's Law. U. S. Senator Barbara A. Mikulski from Maryland announced that her bill introduced to eliminate the terms “mental retardation” and “mentally retarded” from federal education, health and labor laws passed the Senate on Thursday night by unanimous consent. For months people have been blogging, emailing, and twittering about the misuse of the “R” word. If you would like the background and my response to this effort, you may look at my earlier blog on the “R” word. The passage of this law does not guarantee that people will cease to use pejorative terms to describe those who have disabilities, but it is a start. Local and federal agencies will be required to use the new term, as will school personnel. I remember, as a special educator, having to inform parents that their child had been identified as having mental retardation; I also remember their reactions. I hope that this new term will be kinder and more readily accepted. However, there will always be a need to insure that children with disabilities of any kind are treated with respect, regardless of the label used. I think the most important aspect of this law is the way it was initiated and voted into law. The inspiration for the law came from the actions of a family whose daughter, Rosa, was diagnosed with Down syndrome and labeled retarded at school. The mother teamed up with other parents and her state delegate to introduce a bill to change the terminology in her home state law. A hearing on the implications of changing the law was held prior to consideration at the Maryland General Assembly. A similar bill has been introduced in the House and has 63 co-sponsors. The law does not affect any services, rights, responsibilities or educational opportunities for people with intellectual disabilities. There is no end to what we can accomplish when we pull together! Do you think this law will make a difference? It is easy to forget that one method of housing for people with disabilities is still institutionalization in state facilities. Although this arrangement is gradually disappearing, it is still the only choice for many families due to lack of resources, family dysfunction, or other reasons. Two years ago I was dismayed to learn of an event occurring in a state institution for persons with disabilities. The following article was, and is, my reaction. After five decades of observing, I thought it was over. I had hoped we would never again see headlines like the one dated March 27 on NPR.org: Abuse at Texas Institutions Is Beyond ‘Fight Club.’ The article described events in which staff members were charged with taking part in staging “human cockfights,” using residents with mental retardation for staff entertainment. Chronicled on a lost but retrieved cell phone, the evidence pointed to more than a year of staged late-night fights, some as recent as this past January, at the Corpus Christi institution. The second event occurred as I was progressing in my studies in mental retardation; I was shaken and outraged by the disclosure of conditions at Willowbrook, a Staten Island institution for children with mental retardation. Not only were children abused and living in squalor with little medical or mental health care, some of them were reportedly used as test cases for hepatitis studies. The nation as a whole was appalled when a young investigator, Geraldo Rivera, went into the institution with a hidden camera and revealed the unthinkable conditions at Willowbrook. As a student, I felt sure that these dramatic disclosures would demand that residential institutions be carefully monitored and the persons living in them treated with dignity and kindness. The sad truth did not bear out my optimism. When I became a professor in special education in the early 1970s, I took a group of students to visit a residential institution not far from our university. Although this was considered a model facility by many, my students and I witnessed an appalling procedure. As we were touring the grounds, we observed a fenced-in area where a large group of naked young men were being hosed off by attendants. We were appalled at the lack of dignity afforded these residents. Almost half a century later we are still confronted with atrocities perpetrated on those persons most vulnerable in our society. Sure, in response to the article concerning abuse at the Corpus Christi institution, Texas state officials have announced steps to prevent more abuse. They intend to add supervisors to evening shifts, install security cameras in public areas at all 13 state institutions for people with intellectual disabilities, and to “continue to take swift and immediate action when abuse and neglect is reported.” But we know this does not address the real problem. Originally placed in out-of-the way places, residential institutions were designed to protect the residents as well as the community. Such isolation seems to breed neglect and abuse that go unnoticed by citizens at large. The claim that this practice is less expensive for the state is not a valid reason for the continuation of such large, unmanageable facilities. I have felt encouraged by the national trend leading to group homes, supervised apartments, family-supervised living, and other arrangements for people with developmental disabilities to live in communities and enjoy the rights of all citizens. In districts where this occurs, the population as a whole grows in many ways. The inclusion of persons with disabilities adds to the sense of diversity that makes us interested in each other and helps us develop sensitivity to the worth of all individuals. The Texas incident reminds me that we must all be advocates for those less able to advocate for themselves. As advocates, we should be aware of past injustices, learn from our experiences, and be proactive in seeing that the past will not be repeated. In future blogs we will examine alternatives to institutionalization. We will have several guest bloggers who will describe solutions that offer favorable living situations for their family member who has a disability. What solutions have you found or learned about? What questions or concerns do you have? Share with us!